A student-led movement is taking on the NRA, the GOP and the president. This is not only manifesting as a series of protests, this is a movement that may augur major political changes. A solid majority of Americans want to see common sense gun legislation, the NRA and the GOP do not. People and corporations are taking on the NRA and demanding change in the wake the February 14th Parkland Florida shooting at a school named after conservationist Marjory Stoneman Douglas. However, the real heroes of this story are the students themselves. Although the US House passed a bill on March 14th it does not address some of the key issues. This includes changes like increasing the age of eligibility to buy an assault rifle which according to a recent Politico/Morning Consult poll, is supported by 82 percent of Americans. In an apparent concession to the NRA Trump walked back his support for the measure. 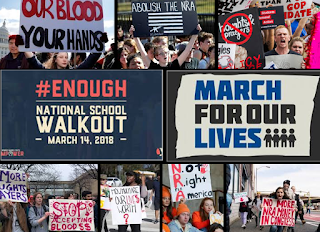 On March 14th at 10 AM students across the country and around the world walked out of their classrooms to protest political inaction on gun violence in America. This included students in Boston who assembled even though classes had been canceled due to a snowstorm. It is estimated that around 200,000 students took part in the demonstration at more than 3000 schools across the country. The 17-minute protest remembered the 17 people who were killed at the Parkland Florida school massacre exactly one month earlier. GOP lawmakers and the NRA were the targets of this national walkout. Student protestors decried the inaction of lawmakers, the Trump administration, and the President himself. To underscore this point protests took place in front of the White House in Washington DC and in front of Trump Tower in Manhattan. Students held signs with slogans like "Fire Politicians, Not Guns". Democratic lawmakers greeted the students in DC, however, no Republicans were present. 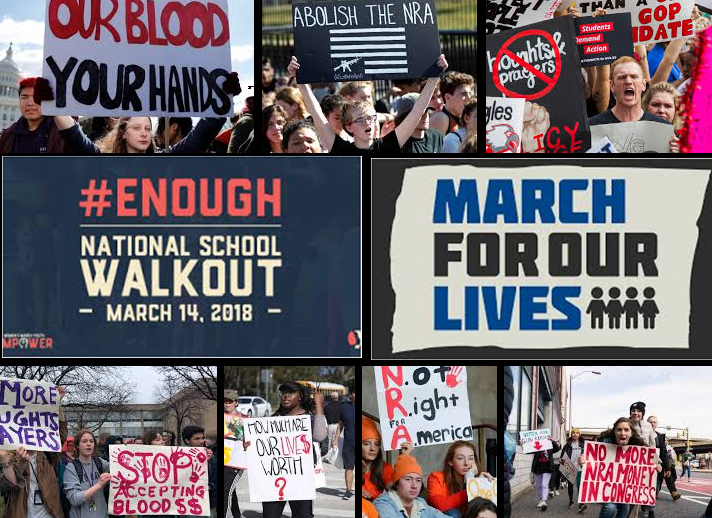 The national walkout is a precursor to a protest scheduled to take place on March 24th. The March For Our Lives protest is expected to be the largest gun violence rally in history, it will take place in Washington DC and in cities and towns all across the nation. A half million people are expected to assemble in the nations capital and many thousands more in cities throughout the US. Although some would like to suggest that all politicians are to blame, the reality is that many Democrats along with former President Barack Obama tried to enact gun legislation in the wake of the Sandy Hook school massacre in 2012. This effort failed due in large measure to the political influence of the NRA and the intransigence of the GOP. Almost all of the millions of dollars that the NRA spends on politicians goes to Republicans. Of the top 100 House recipients of NRA donations 95 are Republicans and in the Senate all of the top 50 recipients are Republicans. Parents, particularly those that have lost children to gun violence are committed to this issue and they have pledged to see it through to the end. A father whose daughter was murdered at the Parkland school said, "I’m tired, but people are counting on me—people with children. I just can’t let it happen to another parent. I can’t." Another father of a slain Parkland school student told Florida legislators, "these acts of violence happen way to often...I have no interest in being polite...we are not going anywhere... this is the time we are going to get this done...I have devoted the rest of my life to defeating this gun lobby". Many parents have indicated that if politicians won't introduce the necessary legislation then they will vote these lawmakers out of office. The NRA has become even more virulent in the wake of the Parkland shooting. Not only are they speaking out against those who are pleading for responsible gun safety measures they are challenging the modest gun safety legislation that passed in Florida. Like the commander and chief, they are masters of spin and deception. They obfuscate and accuse their opponents of doing what they themselves are guilty of. This recent NRA video illustrates the point. Students are going after the NRA and the politicians that support them with a clear-minded vision of what needs to be done. As one student explained, "My generation won't stand for this". They are focused on the source of the problem by calling out Donald Trump, the NRA, and their lawmaker minions in the GOP. They have made it clear that if politicians refuse to change, they will encourage voters to make the change. Sarah Cadwick is a 16-year-old survivor of the Parkland school shooting. She has emerged as one of the leaders of students who are spearheading this passionate and articulate protest. In this video, Cadwick takes on the NRA by responding to the NRA's threats. Emma Gonzalez is another survivor of the Parkland massacre who has become the Internet's leading voice on gun safety. In the absence of responsible government, she is calling for political change. In this speech, she led the crowd in calling efforts to resist sane gun legislation "BS". Like so many of her fellow students, she pulled no punches singling out politicians and the commander and chief. "If they don’t turn around right now and state their open support for this movement, they are going to be left behind," González said. "You are either with us or against us." In this video another survivor Cameron Kasky directly challenged Republican Senator Marco Rubio and the NRA. "We can't ignore the issues of gun control that this tragedy raises. And so, I'm asking -- no, demanding -- we take action now...our politicians abandoned us by failing to keep guns out of schools. But this time, my classmates and I are going to hold them to account. This time we are going to pressure them to take action. This time we are going to force them to spend more energy protecting human lives than unborn fetuses. One of the most frustrating arguments I've heard is that it wasn't the Republican Party that killed those people and it wasn't the National Rifle Association -- it was the shooter himself...However, the shooter is not the only one responsible for this tragedy. While the alleged shooter may have had several issues, he also lived in a society where Sen. Marco Rubio refuses to take responsibility for the role gun culture may have played in this tragedy. And there is no denying that the NRA continues to donate millions of dollars to politicians at every level of government. Then those politicians -- often "family values" conservatives -- rile up their base by making them think that "liberals" are going to take their guns away. Not knowing any better, some of these people stockpile guns in advance of a gun ban that never comes, and the gun manufacturers and the NRA make millions...The Republicans, generally speaking, take large donations from the NRA and are therefore beholden to their cruel agenda. And the Democrats lack the organization and the votes to do anything about it... there is a desperate need for change -- change that starts by folks showing up to the polls and voting all those individuals who are in the back pockets of gun lobbyists out of office. Please do it for me. Do it for my fellow classmates. We can't vote, but you can, so make it count." Students are serious about gun safety and they will not rest until see it through. This movement should not be underestimated. The student that are leading the protests are both passionate and articulate. They are also very well funded. So far the movement has attracted more than $2 million in donations via a GoFundMe page. There have also been some major contributions from celebrities including Oprah Winfrey and Steven Spielberg. George and Amal Clooney have pledged a half a million dollars to help fund a student march on Washington. These students have made it clear that they are targeting politicians, specifically the NRA funded GOP. We have already seen Republicans voted out of office in state elections across the country. Last November Republicans suffered defeats in elections across the nation from Florida to Washington state. In these elections women, minority and LGBT candidates secured historic wins. On March 13th Democrat Conor Lamb defeated Republican Rick Saccone to win Pennsylvania's deeply conservative 18th district. This is a district that Trump won by almost 20 points in 2016. Saccone described himself as, "Trump before Trump was Trump". This was a stunning upset in a solidly red state. The importance of Pennsylvania stems from the fact that it is one of three states that handed Trump the presidency. This is one of the blue collar rust belt states that comprise the core of Trump's support. This has tremendous implications for districts all across the nation. The district is so solidly Republican that Democrats have not bothered to field a candidate for more than a decade. Not only is this a deeply red state it is also a state where Republican gerrymandering was recently exposed by the Supreme Court as unconstitutional. So there was every reason to believe that Saccone would win. Trump did everything he could to secure a win for Saccone. He actively campaigned and held a rally just before the election. He sent in everything he had including Vice President Mike Pence, his son Donald Jr., and his daughter Ivanka. Trump even levied a tariff on steel and aluminum that he thought would appeal to the people of Pennsylvania. According to a Monmouth University poll, the tariffs did not sway voters. Even with all the firepower, Trump threw into the campaign he could not carry his man across the finish line. However, he did energize Democrats to vote against Saccone. Now that students have joined women in rejecting Republicans, it looks as though we may be on the cusp of historic GOP losses in the forthcoming midterm elections. Republicans are now facing what could amount to a rout in the 2018 midterms. Elizabeth Warren was among the Democrats who met with students at the March 14th protest in Washington. "The NRA has held Congress hostage for so many years now," Warren told MSNBC, adding "These young people are here to set us free".